We’ve already posted about the dense fog which has caused problems for cruise ships based out of Port of Tampa and now Port of New Orleans is also dealing with fog. 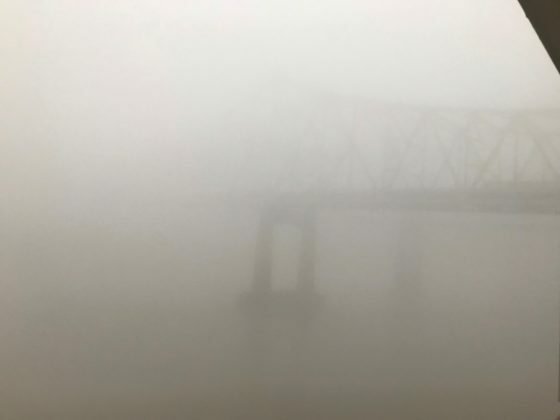 Port of New Orleans is dealing with heavy fog today with the National Weather Service issuing a dense fog advisory. The advisory is set to be in effect until 4:00 PM today which is just in time for when cruise ships are scheduled to depart the port. Thankfully the port has remained open. The National Weather Service in New Orleans has issued a Dense Fog Advisory, which is in effect until 4 PM CST this afternoon. * VISIBILITY…1/4 mile or less at times. Carnival Dream which arrived at the port today made her way up the Mississippi River in dense fog. The ship was coming to the end of a 7-night western Caribbean cruise and the vessel even lost one of its lifeboats on the back, read all about that right here. No delay is expected when the Carnival cruise ship departs later at around 4:00 PM which is when the advisory will end. 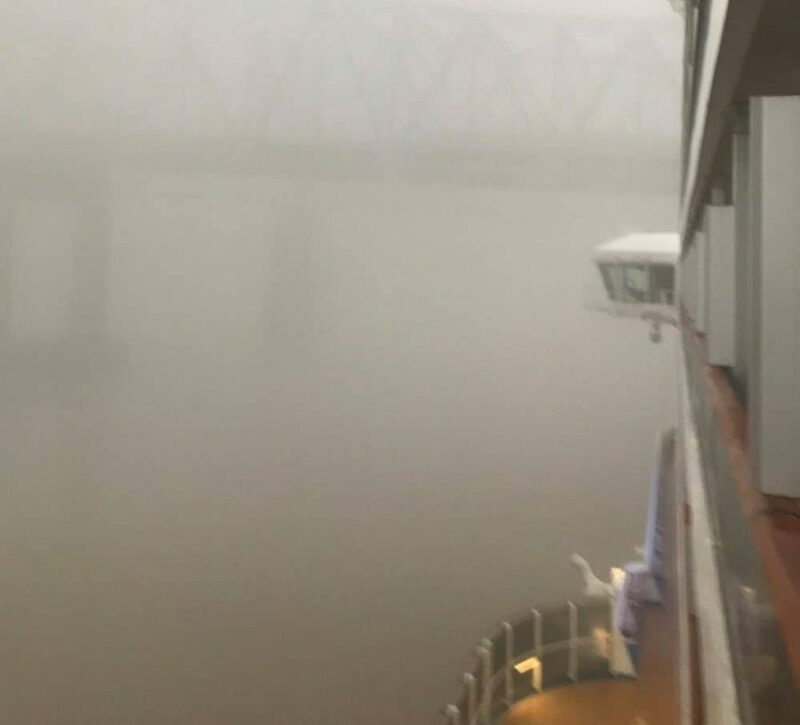 Passengers onboard were surprised when they woke up to thick fog as the ship made her way towards New Orleans. 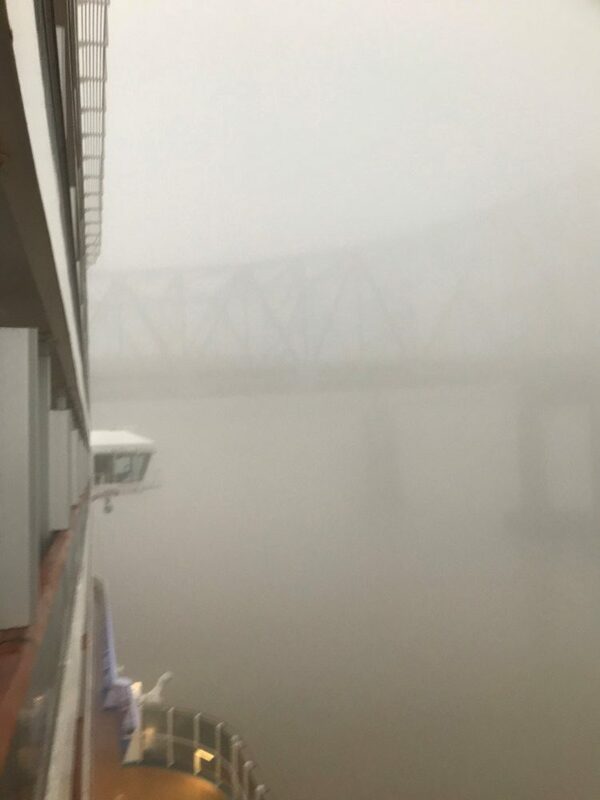 Our friends at Mum’s Travel Blog sent us the following photos of the Carnival cruise ship arriving at the pier with very low visibility. As far as we know there have also been no delays for the Norwegian Breakaway which is operated by Norwegian Cruise Line. The ship is completing a week-long Western Caribbean cruise and is expected to depart later at 4:00 PM for another cruise. If any of our readers are booked on the Carnival Dream or NCL Breakaway December 30 sailings then do double check with the cruise line to make sure the departure time is as normal. Also, allow extra time for traveling to the terminal just in case. Five cruise ships have already been delayed with fog impacting the Port of Tampa Bay on the Florida west coast. Two Royal Caribbean cruise ships were forced to stay in port overnight until conditions improved.